An enzyme called telomerase plays a significant role in aging and most cancers, but until recently many aspects of the enzyme's structure could not be clearly seen. "Many details we could only guess at before, we can now see unambiguously, and we now have an understanding of where the different components of telomerase interact," said Juli Feigon, a professor of chemistry and biochemistry in the UCLA College and a senior author of the study. "If telomerase were a cat, before we could see its general outline and the location of the limbs, but now we can see the eyes, the whiskers, the tail and the toes." Telomerase's primary job is to maintain the DNA in telomeres, the structures at the ends of our chromosomes that act like the plastic tips at the ends of shoelaces. When telomerase isn't active, each time our cells divide, the telomeres get shorter. When that happens, the telomeres eventually become so short that the cells stop dividing or die. On the other hand, cells with abnormally active telomerase can constantly rebuild their protective chromosomal caps and become immortal. Making cells immortal might sound like a promising prospect, but it actually is harmful because DNA errors accumulate over time, which damages cells, said Feigon, who also is a researcher at UCLA's Molecular Biology Institute and an associate member of the UCLA-Department of Energy Institute of Genomics and Proteomics. "Our research may make those things achievable, even though they were not our goals," she said. "You never know where basic research will go. When telomerase and telomeres were discovered, no one had any idea what the impact of that research would be. The question was, 'How are the ends of our chromosomes maintained?' We knew there had to be some activity in the cell that does that." Earlier research led by UC San Francisco professor Elizabeth Blackburn revealed that telomerase was responsible for this activity, but the study didn't connect telomerase to cancer and it provided little information about its structural biology. The research was conducted using tiny, single-celled microorganisms called Tetrahymena thermophila that are commonly found in freshwater ponds. Blackburn won a Nobel Prize in 2009 for the finding. Since then, Feigon and her colleagues have been filling in pieces of the telomerase puzzle, also using Tetrahymena. Their latest study found that the microorganism's telomerase is more analogous to human telomerase than previously thought. Scientists had thought telomerase contains eight sub-units: seven proteins and an RNA. But Feigon and her colleagues discovered two additional proteins, Teb2 and Teb3, that increase telomerase's activity. "Knowing we were the first people in the world who knew about these new proteins was amazing," she said. "Days like that are what scientific discovery is all about, and it's exhilarating." Feigon's research team knew that the RNA strand interacts with the proteins, but not exactly where it interacted. The new study found that within the enzyme's "catalytic core," which is formed by the RNA and its partner proteins TERT and p65, the RNA forms a ring around the donut-shaped TERT protein. Scientists previously knew that telomerase contains three proteins, p75, p45 and p19, but their structures and functions were poorly understood. The new research identified the proteins' structures and revealed that they are similar to proteins found at human telomeres. 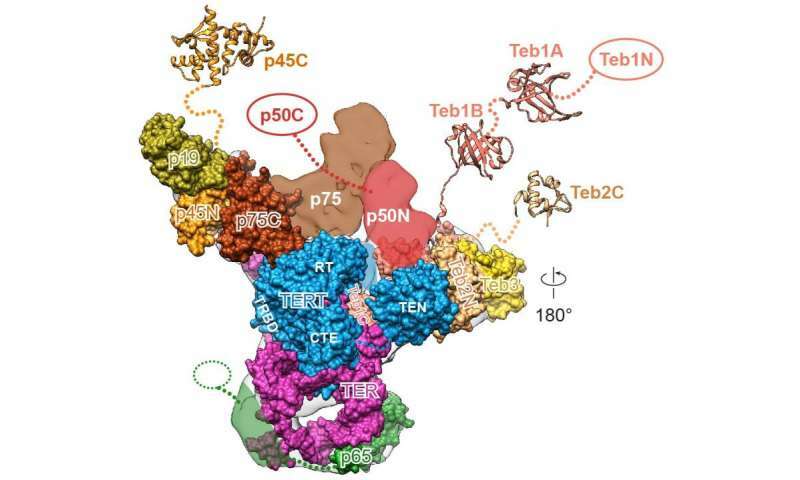 The researchers showed that a key protein called p50 interacts with several components of telomerase, including TERT, Teb1 and p75, and this network of interactions has important implications for telomerase's function. Feigon knew that the Tetrahymena enzyme's catalytic core, where the majority of the telomerase activity occurs, was a close analogue to the catalytic core in the human enzyme, but she did not previously know whether the other proteins had human counterparts. "It turns out that nearly all, if not all, of the telomerase proteins in Tetrahymena have similar proteins in humans," Feigon said. "Now we can use our model system to learn more about how telomerase interacts at the telomeres." "There is so much potential for treating disease if we understand deeply how telomerase works," Feigon said. Among the technologies the researchers used to produce the groundbreaking images were UCLA's cryoelectron microscopes, which are housed in the laboratory of Z. Hong Zhou, director of the Electron Imaging Center for Nanomachines at the California NanoSystems Institute at UCLA and a co-author of the paper. The researchers also used nuclear magnetic resonance spectroscopy, X-ray crystallography, mass spectrometry and biochemical methods.